The White House says President Donald Trump has agreed to meet with North Korea’s Kim Jong-un to seek a deal on denuclearisation while stressing US sanctions will remain in place. President Donald Trump has accepted an offer of a summit from the North Korean leader and will meet with Kim Jong-un by May, a top South Korean official said on Thursday, in a remarkable turnaround in relations between two historic adversaries. 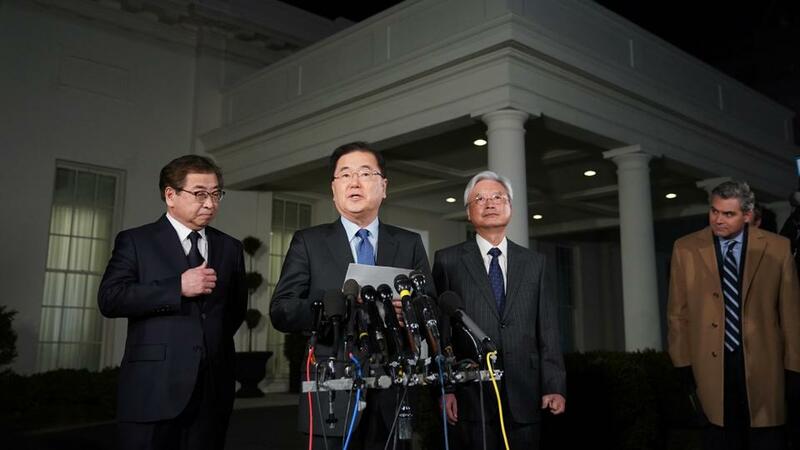 The South Korean national security director, Chung Eui-yong, told reporters of the planned meeting outside the White House, after briefing Trump and other top US officials about a rare meeting with Kim in the North Korean capital on Monday. No serving American president has ever met with a North Korean leader. The US and North Korea do not even have formal diplomatic relations. The two nations remain in a state of war because the 1950-53 Korean War ended with an armistice and not a peace treaty. Seoul had already publicised that North Korea had offered talks with the United States on denuclearisation and normalising ties, providing a diplomatic opening after a year of escalating tensions over the North’s nuclear and missile tests. The rival Koreas also agreed to hold a leadership summit in late April. Trump took office vowing to stop North Korea from attaining a nuclear-tipped missile that could reach the US mainland. He’s oscillated between threats and insults directed at Kim and more conciliatory rhetoric. His more bellicose talk and Kim’s nuclear and missile tests have fueled fears of war. Japan’s prime minister on Friday welcomed the surprise announcement of the summit between US and North Korean leadership. “I highly appreciate North Korea’s change that it will begin talks on the premise of denuclearisation,” Shinzo Abe said, adding that he planned to visit the US to meet Trump “as early as April”. Japan has been cautious about a recent Olympics-driven rapprochement on the Korean peninsula, with Abe warning on Thursday that “talks for the sake of talks are meaningless”. But he sounded a positive note on the planned Trump-Kim summit, hailing it as “the achievement of cooperation between… Japan, the US, and South Korea to maintain great pressure”.